Obviously from a plot development standpoint, it was necessary to have a heart-wrenching scene play out where ChibiUsa is separated from Usagi and the rest of her newfound friends, so I can’t really blame the animation staff for that. 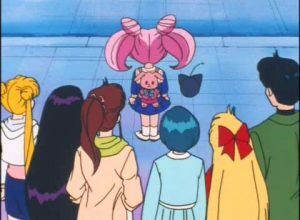 From the point of the Usagi, Mamoru, and the Inner Sailor Soldiers, it makes a lot of sense that they’d be sad to see ChibiUsa go of course. For all they know, they won’t see her again (at this age, at least) for nearly 1,000 years! Of course, Usagi is a mere seven years away from giving birth to ChibiUsa at this point in the story, but that’s neither here nor there. 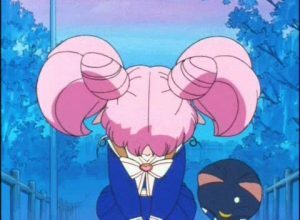 When you look at it from ChibiUsa’s point of view, though, it’s a little harder to understand how emotional she gets over the situation. Though you can understand that she’s developed a different relationship with Usagi than with her mother, Neo Queen Serenity, her relationship with Mamoru (after the Black Moon Arc, at least) is a pretty close to that of a father and daughter. As for Ami, Rei, Makoto, and Minako? Unless they changed extraordinarily (and the manga implies that this is definitely not the case!) and she doesn’t particularly want to meet with them, it’s hard to see why she’d miss them simply because they’re younger. Besides, if ChibiUsa is supposed to be all worked up over missing people in the past, you’d think that it’d be far more reasonable that she’d be broken up over the fact that she, to the best of her knowledge, will never again see her 20th century friends Momoko, Kyuusuke, and especially Hotaru (whose existence in the future, at this point in time, is still unconfirmed). Makoto: She gives ChibiUsa some food that she made. That’s a nice gift, actually, though her advice to “heat it in the microwave” may or may not work so well depending on if there are microwaves in the future. But hey, I consider this a win! Ami: This is where things get weird. Ami programmed an original game for ChibiUsa in which everyone appears. The problem with this? Well, for one, the game is on a 3.5″ floppy disk,1 which are so rare nowadays in 2016 that even some readers of this blog might not have used them! Overlooking for format issue, have to consider that this episode aired on February 25, 1995.2 That means that Windows 95, released on November 23, 1995,3 wasn’t even out yet! Getting Windows 3.1 or MS-DOS software to run on a PC today even nowadays takes a lot of work, so I’d say this is probably not going to work for ChibiUsa. Rei: Another gift for the thoughtful-yet-unusable category, Rei gives ChibiUsa a cassette tape with a recording of some original songs. Though not completely phased out even today, it’s incredibly rare to find compact cassette4 players nowadays, so I’m not sure I’d hold out much hope for her having a listen in the future. It’s the thought that counts, though! Minako: Fortunately, we have a homerun from Minako, who gives ChibiUsa an album of all the photos they took together. Great job! 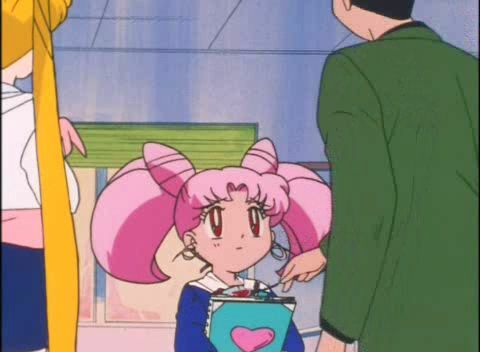 Usagi: In a rather touching move, Usagi had hand-sewn a pink rabbit backpack for ChibiUsa. Like Minako, this is actually a really great gift, so I don’t really have much to say about it! And there you have it! Though the best answer we can really offer to this question is that, well, ChibiUsa probably had bonded with the Sailor Soldiers in the past as something closer to friends, while in the future they probably act a little something like family to her, it’s still hard to say for sure why it is that she would be so broken up to be leaving them only to see them all again in the future. It does make for a tear-jerking and emotional end to Sailor Moon S, though nowhere near as harsh as the death of the Sailor Soldiers in the original season. Obviously the animation staff couldn’t have guessed how fast technology would advance in just twenty short years, but it’s still funny to see just how quickly these things become dated, even in the real world! ← Why Does a Fish Keep Appearing in Sailor Moon? It always struck me as rather cruel that Chibiusa had to seemingly spend her entire life stuck in the body of a child. The 900 years thing made it worse. Didn’t people get a say in how the Crystal affected their ageing? There’s a lot about Crystal Tokyo that bothers me, not least how it conflicts with stuff introduced in later arcs. Which is why I tend to treat as more of an alternate timeline then an inevitable one. I’m going to throw out my own theory, that maybe she just simply enjoyed living a normal suburban life in the past. Perhaps being away from the future also nullified the effects somewhat, allowing her to age normally. Outside of her parents, she seemed particularly fond of Rei. Which makes me wonder what her relationship was like with the CT version. Certainly some of the personality rubbed off. In regards to the gifts, couldn’t Luna-P just turn into a microwave/cassette player? Ami does create it after all. So there’s probably a lot of backwards compatibility. I could be wrong, but I’m pretty confident that they said in the Black Moon Arc that ChibiUsa was cursed (by Wiseman…?) and that’s why she stayed in the form of a five year old for 900 years. That’s why after the Black Moon Arc was resolved she came back a little bit older, and then after Death Busters/Sailor Moon S she returned and was even older. To the best of my understanding, aging is supposed to work normally for the descendants of the Moon Kingdom (including the Sailor Soldiers and Mamoru due to the power of the Silver Crystal) until they reach 22, at which point they stop aging. So ChibiUsa should start aging normally from the Death Busters Arc and beyond. For the technology concerns, Luna-P could probably just turn into what she needs, or I’m sure Pluto could just whip open the Space Time Door, reach in, and grab a tape player for her. Still, it seems kinda funny to me just how much of the technology is dated even in our own timeline now, to say nothing of 1,000 years in the future. You know, you very well may be right… I’ll need to double check that! Her being sad about leaving in the anime never made sense, I think they just had to copy what the manga did. In the manga, it’s shown that while she loves her parents, she definitely feels at least somewhat disconnected from her mother (she basically views her as perfect) and she doesn’t feel that way with Usagi. It’s probably similar with the Sailor Soldiers (loves them, they are family, but it’s not a friendship). And even Mamoru, she still in some ways views him as not her dad. She also had a rough time in the future with the whole not aging and people being mean to her about her failure to manifest any powers, so being a normal kid with no court pressures was probably pretty great. Another great and amusing article Jason! One of the weird things about stuff like this is how times change, but your memories don’t really update! The first time I saw this episode, cassette tapes were totally viable options. =p In fact, I first watched that episode on a fansubbed VHS tape. Eh I don’t think it seems strange for Chibiusa to miss the younger versions of the same people. Let’s start with her parents. First of all they are the rulers of Earth. As such they absolutely have the many many duties of the rulers of an entire planet. I mean consider that they did in fact have to go away for her birthday and leave her behind instead of being able to celebrate it with her. That wasn’t something Wiseman made up, he just made up the part about no one celebrating it later. So honestly I could definitely see where she doesn’t get to spend a lot of time with them often. And a lot of the time she does get to spend with them it’s probably as her parents the King and Queen. Sure they might be able go for an occasional private stroll together, but they can’t really goof off together like their younger versions can. They can’t run around the botanical garden, drop everything to take her shopping for art supplies, spend the day playing games with her at arcade, spend the day at an animal sanctuary on a whim etc. Honestly I’m just guessing here, but I would venture that the most private time that Chibiusa got to spend with her father on an regular daily basis was at bedtime when he could really be himself and would regale her with stories about Sailor Moon. Now I know what many will say next about how her parents didn’t tell her their real names either. I am actually not sure that is the case. Upon re-watching the anime I actually think that just like in the Manga she knows Usagi and Mamoru are her future parents from the very beginning. I mean first of all she does react the first time she hears Usagi’s name, and she knows that she has the Silver Crystal (ie something her mother has in the future) how else did she know that Usagi Tsukino would have had it in the past? Next I noticed that we never get a scene of Chibiusa’s reaction to the news that Usagi is really her mother. She’s conveniently absent from the scene where Usagi/Mamoru/Senshi learn the truth. So that means when she does later wake up she is either told off-screen with us never seeing her react or think about it at all which seems like an very odd and hard to believe choice, or else she is never told before Wiseman abducts her (although she does see her mother and Usagi practically side by side and again no reaction…more on this soon). If it was the latter, then when Usagi channels and transforms into Neo-Queen Serenity you would have thought she would have had some kind of reaction then. But again she has none whatsoever which to me points in the direction that this is not actually news to her. Finally there are a couple other things which if you really think about it means she would have had to have known. The first is Usagi’s family the Tsukinos. Unless her parents and Shingo are all dead I have a very hard time believe that Serenity would have never let them meet their granddaughter/niece. Even if they used fake names, Ikuko and Kenji as adults are still not going to look that different at all in 7 years where Chibiusa would not have immediately recognized them in Usagi’s home in the past as her grandparents. Second is the fact that Neo-Queen Serenity looks exactly like an older Usagi. Now I know that Sailor Moon and Usagi look identical too and no one can figure that out, but there is a big difference. Although the anime never bothers to explain it and I’m not sure the manga ever really got into much detail either the most commonly held plausible explanation why no one recognizes the Senshi is that their transformation contains an magical aspect that prevents recognition in some manner unless you actually witness the change or other proof. (It’s a much better explanation than everyone in the universe being face-blind) However Neo-Queen Serenity lost the ability to turn into Sailor Moon. She doesn’t transform, which means that in fact everyone sees her the same as us, as an slightly older looking Usagi. The only way Chibiusa could not recognize her is if she was a total idiot. Next is the fact that Chibiusa hardly ever talked about the future Senshi. Throughout her time in the past she would occasionally make reference to her mother and father, but I actually don’t recall her ever really mentioning the Future Senshi outside of the Wiseman memory? Again we know they certainly loved her and cared about her. But did they take her shopping, take her home to make a meal, talk about boys with her, take her on a beach vacation, etc like their younger counterparts? I doubt it. Oh and how can we not forget that Serenity apparently felt the need to send Chibiusa back into the past for her to train to be a Senshi. Does that not seem odd that the Inner Senshi of the future couldn’t have given her any training? Another sign that they are too busy to spend that much time with her? Finally there is one more major factor to consider that in the future she herself is Princess Small Lady Serenity. So her life in general is probably quite different. In the past she gets to be just a normal young girl, able to do anything and everything that other normal young girls can do with no additional expectations put upon her. That’s not the case in the future where she is the Princess. She probably doesn’t get to do near the same amount of things as normal girls. We don’t know that she has any friends her age (in the manga/Crystal she doesn’t). Recall why she even took the Silver Crystal in the first place because there were mean people who were pressuring her into being a prim and proper young lady like her mother instead of just acting like a kid (which again the anime gave no indication that she is any older than she looks). So yeah…in conclusion I don’t think Chibiusa being reluctant to leave the past seems all that strange at all. Xenox33, I really agree with your ideas! I just wanted to touch on the reason that she was sent back to the past to train as a Senshi — I think it was because NQS wanted Chibiusa to have the “normal girl” experience. I’m sure she could have trained in the future and learn some awesome skills from the older Senshi. Going back into the past though allows her to live like a normal girl and have that experience that she absolutely would never have in the future. Instead of growing up possibly spoiled and bratty, kind of like how 90s anime Chibiusa is at times, she’ll learn more about self reliance, empathy, and how to better relate with regular folk. So, I think it’s life training along with Senshi training. Another note about going to the past — I presume that after the events of the Black Moon Arc, CT is probably in a time of peace. Going to the past to train would give Chibiusa some REAL experience as opposed to running drills or whatever would go on in the future. Really, in the past she learns as the other senshi learn right with her. I think Xenox33 deserves a guest blog. =p Amazingly detailed, thorough, and thought-out replies… love reading your comments! Doesn’t entirely work for me. Particularly since Naoko was clearly making the plot up as she went.